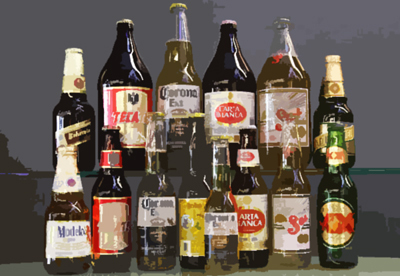 Top 5 must-try Mexican Beers! Besides the almighty Corona, with its amazing worldwide marketing, Mexico has a very rich collection of tasty and top-class beers: even a Mexican entrepreneur started producing the Duff beer (yes, the one Homer Simpson enjoys so much!) few years ago. Since our country is one of the most important manufacturer of this blessed beverage, the diversity (ales, pilsners, lights, bocks, etc..) is remarkable. But of course we have some beers better than others, and that is the purpose of this post: to let you know the top 5 must-try Mexican beers for your next Cancun Great Vacation − probably during an unforgettable Caribbean Carnaval adventure, or while you enjoy the Cancun Hacienda Nights Tour! How did we choose the best 5? Well, someone had to do the hard work, and try them all, right? Definitely the icon beer of Baja California, Mexico. Named after a the northern city where it was first brewed back in 1944, the Tecate beer with its familiar red and gold colored can is the most consumed elixir in the northern border. Smooth and light, this pilsner is definitely worth trying with shrimp or fish ceviche! One of the most traditional and old beers in Mexico. Under the tagline: “The beer of Mexico,” it was first brewed in 1865. This pilsner-Vienna beer has an amber color and a unique taste that makes it favorite among locals and tourists. Fact #1: The Victoria beer is sold ONLY in Mexico. Fact # 2: You’ll have to come down here to try this Mexican pride. It took its name from the Mexican traditional flower, Nochebuena (known as the Poinsettia in US & Canada), very common during the Christmas season. Definitely one of our favorites! Not only because is the best bock beer (strong body, malty taste with some caramel and chocolate in it… yummy!) in Mexico, also because it’s a seasonal beer! You can only find it from mid-October to January. And guess what? It’s here now! What are you waiting for? Available all year long, Pacifico beer is deservedly one of the top three in this countdown. It was born in Mazatlan, in the northeastern coast of Mexico in 1900. This light and highly refreshing pilsner is one of the top Mexican exported beers today. The best choice for a sunny day, laying on a sandy Cancun beach. Although not the more tasty and the most appealing, Corona beer is the Mexican celebrity. It’s sold in 159 countries in the 5 continents and it’s one of the top selling beers in the world. With a mild flavor and a very light color, this pilsner is one of those you have to try during your next Cancun great vacation (even though you’ve probably done that in almost any other place on the planet). Salud!! You have any other Mexican beer suggestions? Please, let us know!